As any long-time reader of science fiction can tell you, “The Great Silence” is another name for the Fermi Paradox, and the Fermi Paradox is a meditation on two contradictory truths: 1) the idea that we represent the only intelligence in the universe is preposterous and 2) despite the increasing range of our extraterrestrial search, we have found only silence. Click to purchase the full collection. Ted Chiang’s very short story, “The Great Silence” adds another set of questions to these speculations. Why, he asks, are we so interested in finding intelligence in the stars and so deaf to the many species who manifest it here on earth? And also: why have we demanded that, as proof of intelligence, non-human animals communicate to us in human language, and then dismissed those creatures that actually do so? Chiang’s story was written in collaboration with the visual artists Jennifer Allora and Guillermo Calzadilla, as an accompaniment to a video installation that juxtaposed the radio telescope at the Arecibo Observatory in Puerto Rico with the endangered parrots in the forests nearby. I regret that I haven’t been able to experience Chiang’s words along with those images, as was intended. But even on its own, Chiang’s story has enormous power. Using some of the standard tools of poetry — brevity, compression, language — Chiang achieves the poetic effects of complexity, scope, and resonance. Every line rewards further consideration. Every line unfolds into its own philosophical and heartbreaking space. Humans can be assessed directly through comparison with non-humans. Science fiction is well suited to thought experiments and philosophical questions regarding the Other. Humans can be assessed directly through comparison with non-humans. Sometimes the non-humans are machines. Sometimes the non-humans are aliens with their own inexplicable extraterrestrial agendas. But sometimes, and with increasing frequency, the non-humans are all the other animals with whom we share our planet and about whom, for all our centuries of co-habitation, we still know so little. In Chiang’s story, the Great Silence is finally coming home. 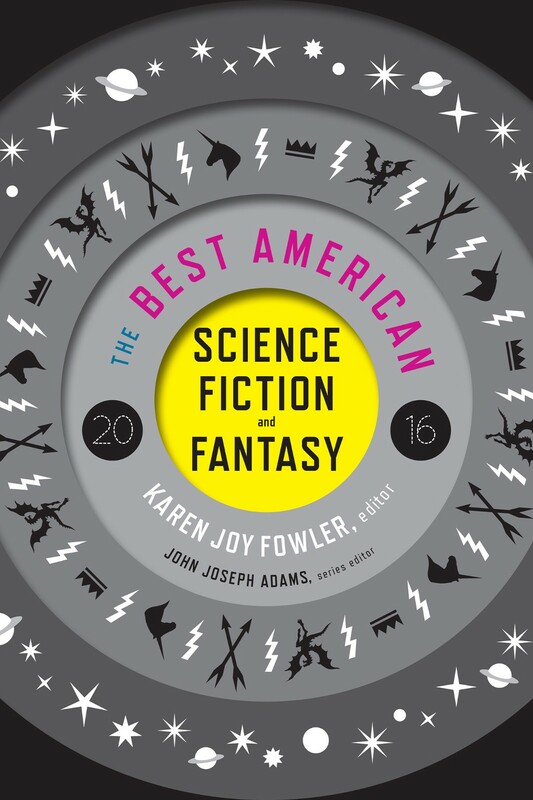 Karen Joy Fowler is the author of six novels and three short story collections. The Jane Austen Book Club spent thirteen weeks on the New York Times bestsellers list and was a New York Times Notable Book. Fowler’s previous novel, Sister Noon, was a finalist for the 2001 PEN/Faulkner Award for fiction. Her debut novel, Sarah Canary, was a New York Times Notable Book, as was her second novel, The Sweetheart Season. In addition, Sarah Canary won the Commonwealth medal for best first novel by a Californian, and was listed for the Irish Times International Fiction Prize as well as the Bay Area Book Reviewers Prize. Fowler’s short story collection Black Glass won the World Fantasy Award in 1999, and her collection What I Didn’t See won the World Fantasy Award in 2011. Fowler and her husband, who have two grown children and five grandchildren, live in Santa Cruz, California. “The Great Silence” by Ted Chiang from THE BEST AMERICAN SCIENCE FICTION AND FANTASY 2016 published by Houghton Mifflin Harcourt. Copyright © 2015 by Ted Chiang. Used by permission of the author. All rights reserved.